“When Christ was circumcised, the Law was incised. *1. Preamble: The 1st of January is primarily The Despotic Feast of the Circumcision of Christ, whereby we commemorate an event which took place eight days after Christ’s birth in the flesh at which Christ received his name Jesus (=Savior). This Feast conjoins The Despotic Feast of Christmas, i.e. of the Birth of Christ (25th of December) with The Despotic Feast of the Theophanies or Lights, i.e. of the Baptism of Christ (6th of January), and constitutes with them the so-called festal period of The Dodekaemeron (The Twelve Days). Initially these three Despotic Feasts of The Dodekaemeron were included in one ancient feast, The Feast of the Theophanies (6th of January), the theme of which was the revelation of the One God in Trinity in the Person of the Lord Jesus Christ. The selection of the 6th of January for this Feast seems to have been caused by the fact that it was already a festal day in the old Roman calendar as the day of the winter solstice (equal day and night) when the duration of the day began to increase and against that of the night which began to diminish proportionately. The Roman idol worshipers celebrated on that day the birth of the invincible sun as the god of the physical light which supports the physical life of the world. The Christians responded to this challenge by celebrating the coming of Christ into the world and putting forth Christ as the sun of righteousness who grants the uncreated Light of the One true God in Holy Trinity which enlightens every human being that comes into the world. Later on the 25th of December was established as the day of the winter solstice and of the birthday feast of the visible sun. The response of the Christians to this new challenge of the idol worshipers was the transference of The Feast of the Birth of Christ (Christmas) to this date, while the 6th of January was retained ever after as The Feast of the Baptism of Christ. It was inevitable that The Feast of the Circumcision of Christ would eventually follow The Feast of Christmas eight days afterwards. 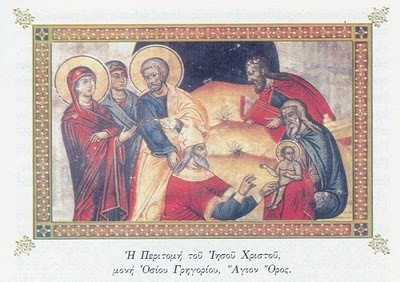 The oration On the Feast of the Circumcision of Christ by St. Andrew of Crete (660-740), who is known from his amazing hymns and sermons, explains to us the meaning of this Despotic Feast, which belongs to the entire work of the revelation of God and our salvation, accomplished by the incarnate Son and Word of God, our Lord and Savior Jesus Christ. Because this oration is too dense, we present it here in a more analytical and exegetical way. *2. The Despotic Feats and the Events of the Life of Christ: St. Andrew begins by noting “that it is good and God-pleasing that we glorify God and celebrate all those things which Christ our Saviour accomplished in His earthly life, because He accomplished them not as a mere man but as a God-man.” Whatever Christ did, says the holy father, “constitute amazing miracles, because they have a divine-human (theanthropic) basis and a divine-human character. This is why they are unique and saving. Indeed, they could not have been anything else (! ), because Christ is truly God who became truly man.” And He did all these things, because He wanted “to reveal himself to us human beings who had been alienated from Him and were ignorant of him; and also to endure as true man all that is human so as to fulfill all the commandments of the divine law which had been given to us by God, with the ultimate aim of exchanging these things with better and more perfect ones.” The verb “exchanging,” which St Andrew uses here, characterizes the entire work (the incarnate economy) of Christ, which is a saving exchange. By his incarnation God assumed all that we have and exchanged them all with others, full of grace and truth. He wanted to do and did so out of love for humanity and because only in this way He could restore to our humanity its real and natural condition, as He had originally designed it Himself as true God. God’s becoming man was God’s antidote to man’s apostasy which made him loose his way in life and become alienated from the divine grace. God became man in order to deify us human beings with His divine-human person. *3. 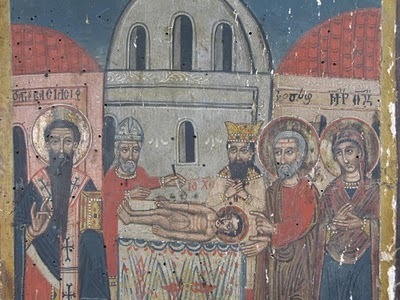 The Despotic Feast of the Circumcision of Christ: The circumcision which Christ underwent eight days after his birth in the flesh and His seedless coming forth from the Virgin Mary, reveals this exchange which leads to the deification of humanity. We celebrate this event by means of a special feast, because it truly constitutes, as St. Andrew says, “a supreme miracle.” Why? 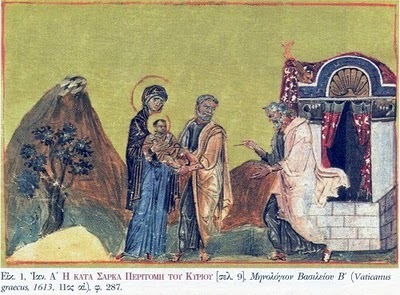 Because through this the divine-human Christ “not only fulfilled the law, but also revealed simultaneously the way of surpassing it, as He revealed the true dimensions of our salvation.” In his oration St. Andrew of Crete gives us in a synoptic way these dimensions of salvation which the incarnate God offers us. *4. 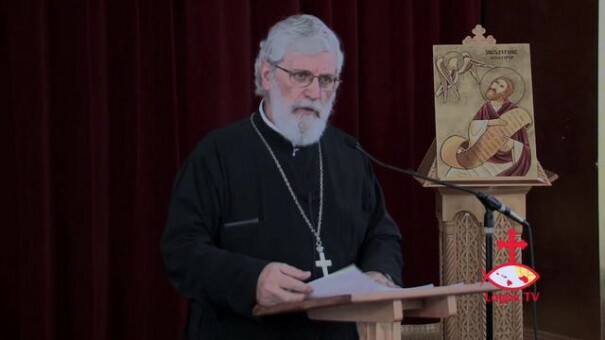 The Meaning of the Circumcision of Christ: True man and True God! By undergoing circumcision and receiving a human name, according to the Jewish context within which He was born, Christ proved that He was true man, although He pre-existed as true God, infinite and incomparable as He always was. He became man within a specific space-time conditioned, religious anthropological context and followed the path and prescriptions pertaining to the human nature and its relation to God its creator. His circumcision, says St. Andrew, “reveals that He is no longer only Son of God but also Son of the Virgin. He is and remains literally Son of God, just as the Father is literally Father because He begets the Son, and the Holy Spirit is literally Spirit because He proceeds from the Father, and so these three divine persons, the Father, the Son and the Spirit constitute one God and there is in them one Godhead.” Christ, however, “is the Son of the Virgin and exactly for this reason He is also comprehensible and accessible to us human beings.” His becoming man does not mean that He ceased being God. It rather means, that “He became our man, authentic, true and perfect man, whom we can now approach with courage not only as Master and Creator but also as our Saviour because He is with us. He assumed our nature, followed its true path, and led it to its perfection. And now He offers it to us as an exchange and antidote so that we too may become true, authentic and perfect human beings as He is.” This is how Luke presents Him in his Gospel narrative, which St. Andrew recalls, because he wants to show this divine-human (theanthropic) miracle which Christ presents, i.e. God’s becoming man (inhumination) and man’s deification (theosis) in Christ. *8. The name Jesus as the main Message of the Feast of the Circumcision of Christ: What the present Feast, then, primarily offers us is the revelation of the true identity of Christ. As St Andrew tells us, “The Feast gives us its deeper meaning because it shows us that the one grace (of the incarnation) presents to us another (that of the economy of salvation) and unites them with the knowledge (of the Savior), enlightening us with the special brightness and glory of His person.” “Already,” says the holy father, “we celebrated the event of His birth, and came to realize that it was ineffable, and to recognize that the Virgin mother gave birth to her son in a seedless manner. But now we are called to turn to the Son who was born without hesitation or fear. Today’s Feast calls us to understand Him from the Name which He took for our sake.” This is the name Jesus which means Savior, Emmanuel, God with us, i.e. He who came to reconcile, to familiarize and to assimilate us, human beings, with God, and so to grant to us eternal salvation. *9. The Power of the Name of Jesus: The power of the Name of Jesus which Christ received at His circumcision is what St. Andrew stresses through a dialogue which he conducts with the angel of the Gospel! It is significant that in this dialogue the Name Jesus is conjoined to the Eighth Day. This is why the saint goes on to explain synoptically but carefully the deeper soteriological meaning of this Day in his last and most dense paragraph. *10. The Eight Day is a transition from an infantile state to personal perfection; because on this Day, according to the Jewish religious prescriptions, an infant becomes a child, comes of age, acquires a specific personality. The holy father distinguishes the first 7 days following the birth of an infant from the 8th, saying that “the 8th is a complement to the 7 and the beginning of the future.” Why? Because, according to the Jewish religious context, the eight day constitutes an important milestone for each newly born human existence, inasmuch as it completes the infantile age and opens the age of maturity which leads to completion (perfection). “The 7 days complete the infant, but the 8th day perfects it by including it among the perfect human beings.” And how is this done? “It is done,” says the holy father, “by means of the Name which is given on the eighth day.” The naming, in other words, offers an infant a specific personal identity; it makes it from an anonymous infant, an eponymous human being. It recognizes solemnly its natural right to be a specific name-bearing (personal) existence, a wholesome, perfect, i.e. perfectly constituted human being amongst other specific human beings. In the formulation provided by St. Andrew, “the 8th Day is the starting point or coming of age, because the infant, which has completed its (physical) constitution in the seven days (of its creation), is now registered (by its personal name) as a pupil who is to take mentoring lessons,” and thereby be moulded into a particular personality. The Eight Day, then, is most significant because it changes all that belongs to infancy. The week of the 7 days (of creation) brings with it the infantile growth. The Eighth Day, however, brings in the perspective of (personal) perfection. It is clear that perfection refers here to the personal identity, which every infant acquires when it receives its name. But why should naming be connected with circumcision on the eighth day? Being God and man, Christ has “kept Sabbath,” i.e. fulfilled and abolished all those things which the ancient law specified for the flesh. On the Eight Day of His Resurrection he became the universal legislator of the entire world. Not only of the Jews, but also of the nations, offering to all without distinction the anointment and perfection of the Holy Spirit and thereby calling them all with His own name, Christs (i.e. Christians). He replaced the circumcision of the flesh by the rejection of all the carnal and passionate thoughts and also by the enlivenment of every good work and good act which lead to the kingdom of heaven. He is truly “the Angel of the Great Counsel of the Father, the mighty God, the Ruler, the Leader of Peace, the Father of the age to come,” whom we commemorate, exalt and worship with the Despotic Feast of the Circumcision of Christ. Without change you took a human form, by nature being God, O most compassionate Lord; and fulfilling the Law, you willingly accepted circumcision in the flesh, that you might banish shadows, and strip away the covering of our passions. Glory to your goodness; glory to your compassion; glory to your ineffable condescension, O Word! According to the ever memorable Greek liturgist Ioannis Foundoulis, the Feast of Christmas was first introduced in Rome in 330 and afterwards in the East in 376. This is confirmed by St. John Chrysostom, who says in his “Oration on the Birthday of the Saviour” on December 25, 386, that this Feast was introduced in the list of feasts of the Church 10 years earlier. Rom. 2:16, 16:25, I Cor. 15:1, Gal. 1:11, 2 Tim. 2:8., etc. Cf. «του Θεού» in Luke 3:38 and also the entire genealogy of Christ in 3:23-38. Great post! Keep on writing. I like your pictures.